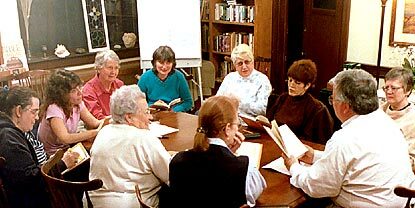 The Book Study Group gathers every Wednesday evening (except the first Wednesday of every month) to discuss a book chosen by the group and the pastor. We discuss the ideas in the book and own responses to the book's message. The group seeks to deepen their faith by deepening their understanding. We welcome those of committed faith as well as those who are not yet part of a church. © copyright 2006 The Garden Church. All rights reserved.